Our 7th annual Grow Your Tenner campaign has now closed! The full £100,000 match fund pot has been allocated. During this campaign over 324 Localgiving members raised close to £360k from 1,649 supporters. We want to take this opportunity to congratulate every participating organisation for their incredible fundraising efforts. During this campaign we matched monthly donations by up to £10 for a full 6 months. After six initial donations, the following six donations will be matched. Not a Localgiving member? Registration only takes a few minutes and we'll aim to get you online within one working day. Join us here. Start date and time: 10am on Tuesday 11th of December 2018. Please note that donations made before 10am will not be matched. End date and time: Whenever the match fund runs out or midday on Thursday the 10th January 2018 (whichever comes first). Matching conditions: Monthly donations set up during the campaign will be matched by up to £10. The matching will take place after the first 6 donations, and be applied to the following 6 donations. Please note that monthly donations continue unless cancelled by the donor. It is the responsibility of the donor to cancel their Direct Debit mandate should they wish to do so. Donations made after the match funding runs out will not be matched. Donations outside of the supporter and charity limits detailed below will not be matched through this campaign. Please note that we cannot guarantee the length of the campaign and donations will only be matched whilst match funding is available. This campaign will not match one-time donations. Please remember that If you set up a monthly donation during the campaign, the matching will not apply for the first 6 donations. Supporter limits: Each supporter may set up one Direct Debit donation to a Localgiving member they wish to support through the campaign. No more than one Direct Debit may be set up per individual to each Localgiving member, but a supporter may donate to as many charities as they wish. Charity limits: Each charity may receive up to £5,000 match funding. Donations to the charity will be matched until their limits are hit or match funding has run out, or the campaign ends. Match fund size: We have a match fund pot of £100,000. Changes to conditions: Please note, these conditions are subject to change if the size of the match fund increases significantly. All Localgiving members will be notified via email of any campaign updates before the start date. “It’s an amazing opportunity …we raised more through Grow Your Tenner than our last major fundraising event and you cannot compare the effort involved! Not only does it raise funds but Grow Your Tenner is another way of getting new contacts and new long term supporters.We are so lucky to be part of it!" Get clued up on how the Grow Your Tenner campaign works. Please note, these FAQs are subject to change if the size of the match fund increases. We'll inform all Localgiving members of any updates via email. If you have a question we haven't covered, give us a call on 0300 111 2340 and we'll be happy to help! How do I take part in Grow Your Tenner 2018? If you're a charity or community group: All you need to do is make sure that you have an active Localgiving membership. All groups with an active Localgiving membership will be automatically eligible for match funding through the campaign. If you are not currently a member of Localgiving, then you can join here. If you're a supporter: All you need to do is set-up a monthly donation to your chosen charity whilst the campaign is live to secure match funding on your gift. If the charity you wish to support isn’t a member of Localgiving, you can advise them to join here. How much match funding will be available? 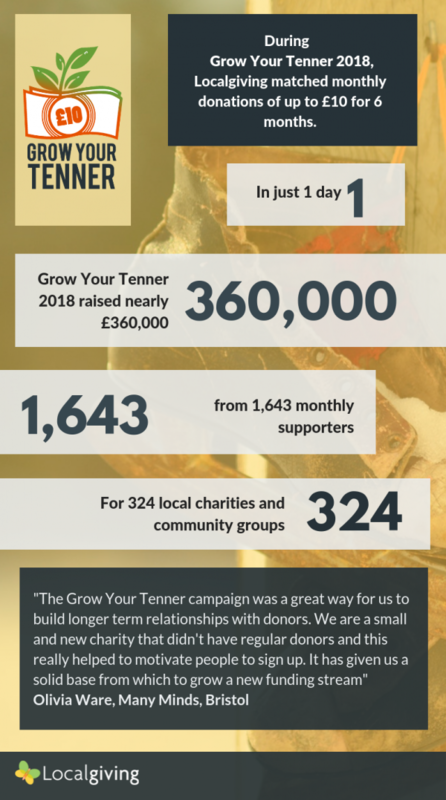 Grow Your Tenner 2018 has a total match fund pot of £100,000. When will the campaign run? Grow Your Tenner, will start on Tuesday 11th December at 10am and run until the match funding runs out or 12am on Thursday the 10th January - whichever comes first. What are the conditions of Grow Your Tenner 2018? During Grow Your Tenner donors can set-up a monthly donation and after the first six donations, the following six donations will be matched up to £10 a month. Is there a limit to the amount that each charity can raise? Each charity or community group that is a member of Localgiving has a maximum of £5,000 match funding available to them through the campaign. Is there a limit to the number of donations each donor can make? Each donor may make a maximum of one monthly Direct Debit donation to each charity they support. Donors may support as many charities as they wish through the campaign and have their donations matched up to this limit whilst match funding is available. When should I donate and how can I make sure my donation is matched? In order to benefit from match funding, please make sure you start making your donation after the campaign start time of 10am on Tuesday 11th December. Match funding is reserved at the start of the donation process, so please wait until after 10am to begin making your donation. Any donations started or set up before this time will not be matched, even if they are completed after 10am or the first payment is due to be made after the start of the campaign. Please be aware that we cannot guarantee how long the match fund will last and once all funds have been allocated no more donations will be matched. Can I claim Gift Aid? The option to claim Gift Aid and add an extra 25% to your donation will be available during the donation process. Please read the check boxes and answer honestly to ensure that you make a legitimate claim. For more information on Gift Aid rules, please click here. Can someone donate more than £10 a month? Yes. A supporter can make a Direct Debit donation of any amount between £2 and £5,000 through Localgiving. Please note that a maximum of £10 match funding will be applied per month. For example, a direct debit for £5 set up during the campaign will be matched by £5. A direct debit for £20 set up during the campaign will be matched by £10. Can donations through fundraising, project and/or appeal pages be matched? No. Donations made through fundraising, project and/or appeal pages will not be matched this year. Only direct debit donations made through your main page will be matched. Will I need to set up a new Direct Debit in order to benefit from matched funding? Yes. Only new monthly Direct Debits that are set-up during the campaign will be eligible for match funding. Existing Direct Debits made through Localgiving will continue as normal. Please note that you must wait until after 10am on Tuesday 11th December to set up the Direct Debit in order for it to eligible for match funding. Direct Debits set-up before this time will not be matched, even if the first payment is due to be made after the start of the campaign. Please note: you can only set up one monthly donation per charity you wish to support. Can I collect donations at an offline event (cash collections) and put this through the website to get matched funding? No, this constitutes recycling of funds, which is in breach of our terms of service. Donations must be made by a supporter directly through the Localgiving site to be eligible to be matched. I'm holding an event to raise money for my charity, how can I use Grow Your Tenner? In order to benefit from match funding, donations must be made by supporters online via Localgiving. Cash collections and income from trading (selling tickets etc) cannot be processed via Localgiving. If you are holding an event to raise money for your group, and you would like to use this as an opportunity to benefit from match funding, we advise that you have a laptop or tablet at your event so that people can set up Direct Debit donations to your group online. You can also direct supporters to set up their monthly donation via their smartphone using our mobile site. Please note, as per our terms of service, trading activity (ticket sales) is not supported by Localgiving. Will the campaign change if the size of the fund increases? We will try to keep any changes to the conditions of the campaign to a minimum, however, if we are able to significantly increase the size of the fund then we may look to change the terms of the match fund in line with the conditions of the funder. We will give as much notice as possible if this is the case and ensure that all Localgiving members are notified via email before the start of the campaign. What happens after I have made 12 monthly donations? Your Direct Debit will continue to make monthly donations to your chosen charity. Monthly donations will continue unless you cancel them. It is your responsibility to cancel your Direct Debit mandate should you wish to do so. How will I know if the campaign has ended? Once the campaign has ended, there will be notifications on charity pages to confirm that donations will no longer be matched. Localgiving will announce the end of the campaign through social media and our newsletter. How will I know if a charity has reached its match fund limit? If a charity reaches its match fund limit the notification on their page will confirm that donations made to the charity will no longer receive match funding. What if a donation is made before the start time? Any donations made before 10am on Tuesday 11th December will not be matched. Once the campaign has started there will be appropriate notifications on charity pages and through the donation process to confirm that donations will be matched. If you do not see these notifications please wait until they appear before making your donation. How can I find out if my donation has been matched? Once you have made a donation you will receive a confirmation email from Localgiving, which will include details of your donation and any match funding that has been allocated. Will one-time donations be matched? Can supporter still make one-time donations? Yes, of course, but they will not be matched through Grow Your Tenner.